Chanderi FortHeight : 2330 ft.
On the way from Kalyan to Karjat on the Bombay-Pune rail-route, lies a mountain range. Seen towering high over the rest of the range is a plateau, which is Chanderi. Lying between Badlapur and Vangani railway stations on the Badlapur to Karjat road is a village called Goregaon. From here starts the path that leads us to Chanderi. Chanderi is one amongst illustrious forts like Karnala, Prabalgad, Irshalgad, Manikgad, Peb, Matheran lying in the mountain ranges of Nakhind, Chanderi, Mhasmaal, etc. Although worth mentioning as the jewel in the crown of forts in the district of Raigad, there is no significant history attached to this fort. Near the caves on the fort are visible some remnants of fortification. This is the only sign to designate Chanderi as a fort. In May 1656, Shivaji Maharaj conquered all territory up to Kalyan-Bhiwandi-Rairi. This was when this fort came under the rule of the Marathas. Lack of development, low water storage areas, absence of significant constructions, limited facilities for people to stay and extremely difficult approach road seem to suggest that rather than a fort, this was possibly a military base. A desecrated idol of lord Shiva can be seen inside the cave. Very near to the cave is a reservoir of potable water. However, water is available only till the month of October. The cave can comfortably accommodate 8 to 10 people at a time. Another reservoir of water is situated at the base of the pinnacle near the cave. The area on the top of the fort is not too much to wander. Due to landslide, reaching the top of the pinnacle has become extremely difficult. To the east of the fort, one can see Matheran, Peb, Prabalgad range, etc. 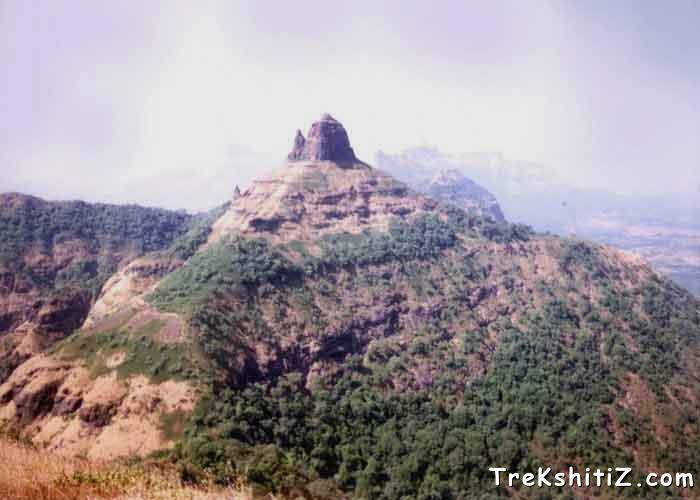 while to the west, can be seen forts like Bhimashankar, Siddhagad, Gorakhgad, Peth, etc. The area at the foothills of Chanderi is very alluringly enchanting in the monsoons. Many tourists travel here to enjoy the waterfalls. Alight at Vangani station on the Mumbai-Karjat rail-route. From there, follow the railway track (towards Badlapur) till you reach Goregaon village. A dirt-path going to the left from the main road leads to village Chincholi at the base of the fort. It is also possible to hire a vehicle from Vangani station to get to this village. Alternatively, you can walk down to Chincholi from Badlapur Station in about 45 minutes. Leaving behind Chincholi towards your right there are two paths trailing upwards from either side of a small hillock. The path going from the right hand side of the hill is rocky while the path on the left hand side meanders through shrubbery growing on slippery red mud. Both the paths lead to a small peak. From here keep walking towards a �T�-shaped niche equidistant from the two mountains ahead. The mountain to the right is Mhasmaal while the tall pinnacle to the left is Chanderi. A little ahead of the peak lie few steams of water. The path just above these leads to the waterfalls. Once beyond the hollow of the waterfalls, start climbing on the path towards the left to reach the top. Approximately in an hour, you will reach the peak. The path is very narrow and on both sides slope steeply down to the valley. The path to the left leads to the cave. It would be ideal to engage a guide for trekkers visiting Chanderi for the first time. Cave on the fort can accommodate 8 to 10 persons. Drinking water is generally available in the reservoir till the end of October every year (based on the monsoons). It takes about 1� hrs from the village of Chincholi. Rock climbing is necessary to reach the top of the fort.